As part of a series of protests against housing conditions in Derry, the Derry Housing Action Committee (DHAC) held a sit-down protest on the newly opened second deck of the Craigavon Bridge in the city. 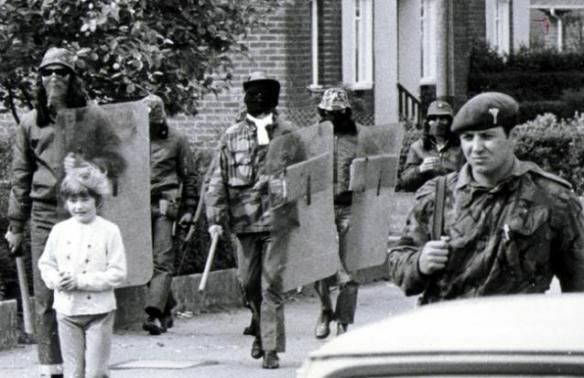 Beginning in the afternoon, the British Army carried out extensive house searches in the Falls Road area of Belfast for members of the Irish Republican Army (IRA) and IRA arms. A military curfew was imposed on the area for a period of 34 hours with movement of people heavily restricted. The house searches lasted for two days and involved considerable destruction to many houses and their contents. During the searches the army uncovered a lot of illegal arms and explosives. The Ulster Defence Association (UDA) and the British Army come into conflict about a ‘no-go’ area at Ainsworth Avenue, Belfast. Máire Drumm, then Vice-President of Sinn Féin (SF), said that SF was ready to talk with representatives of the Ulster Workers’ Council (UWC). This statement followed an offer by Andy Tyrie, then leader of the Ulster Defence Association (UDA), to be involved in negotiations with the Irish Republican Army (IRA). At this time there were a number of areas of common interest between Loyalist and Republican paramilitary groups including the issues of Internment and prisoners. In the United States of America (USA) a federal court ruled that Noraid (Northern Ireland Aid ?) would have to register as an agent of the Irish Republican Army (IRA). The home of Gerry Fitt, formerly the Member of Parliament (MP) for West Belfast, in Belfast was set on fire by Nationalist youths. The house was not occupied at the time. The Orange Order organised a large Loyalist protest demonstration in Portadown, County Armagh, against the re-routing of a Loyalist parade away from a Catholic area of the town. The first taxi driver to be killed during the ‘Troubles’ was shot dead by the Ulster Freedom Fighters (UFF). [In the coming years taxi drivers were to become regular targets for the paramilitary groups.] In a dispute over the display of emblems in the workplace Shorts Aircraft company suspended work in three production plants. 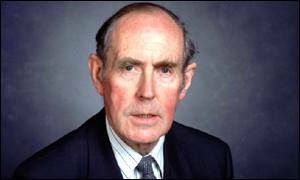 In order to try to prevent the complete collapse of the negotiations Peter Brooke, then Secretary of State for Northern Ireland, announced at Westminster that he was bringing this stage of the political talks (later known as the Brooke / Mayhew talks) to an end. 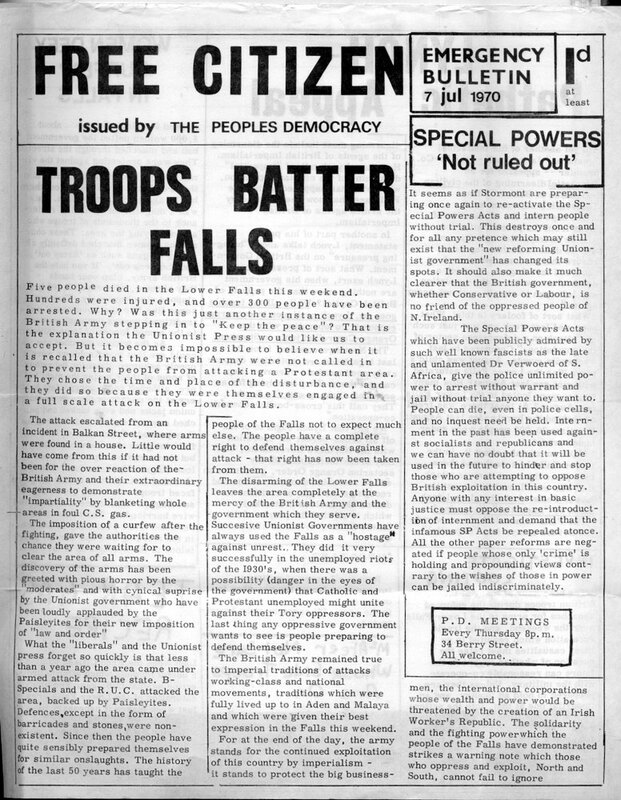 The Sunday Tribune (a Dublin based newspaper) carried a report that the Irish Republican Army (IRA) was considering a ceasefire. Lee Clegg, a paratrooper with the British Army, was released from prison on the orders of Patrick Mayhew, then Secretary of State for Northern Ireland. Clegg had received a life sentence and been imprisoned in June 1993 for the murder of Karen Reilly (18), a Catholic civilian, on 30 September 1990. The decision to release Clegg sparked serious rioting in Nationalist areas of Northern Ireland. Sinn Féin (SF) and representatives of Loyalist paramilitaries called for the immediate release of all political prisoners. Breidge Gadd, then Chief Probation Officer for Northern Ireland, resigned from the Life Sentence Review Board in protest at the decision. John Bruton, then Taoiseach (Irish Prime Minister), said that he expected the British authorities to apply the same rules “to other similar prisoner cases”. Relatives of those killed on ‘Bloody Sunday‘ presented a 40,000 signature petition for a new inquiry into the killings to Marjorie (Mo) Mowlam, then Secretary of State for Northern Ireland. Tony Blair, then British Prime Minister, held a meeting at 10 Downing Street with Bertie Ahern, then Taoiseach (Irish Prime Minister), to discuss matters related to Northern Ireland and in particular the Drumcree parade on 6 July 1997. Ahern said that it would be a mistake to force the march along the Garvaghy Road. Mowlam held meetings with the heads of the security services about Drumcree. The Ulster Unionist Party (UUP) issued a statement supporting the Orange Order’s right to march down the Garvaghy Road in Portadown, County Down. Gerry Adams, then President of Sinn Féin (SF), issued a statement backing the Garvaghy Road residents and called for the forthcoming march to be rerouted. Denis Bradley, a former Catholic priest, revealed that he had been one of a number of members of “The Contact” and had acted as a ‘go-between’ for MI6 and the Irish Republican Army (IRA). Bradley said that he had dealt with Frank Steele (then a member of the British diplomatic service) and Michael Oatley (who was referred to by Republicans as “The Mountain Climber”). The revelations were contained in a report in the Derry Journal newspaper. The Irish Times (a Dublin based newspaper) carried a report on what it termed a “ethno-sectarian” campaign by Loyalist paramilitaries against Catholics and couples in mixed marriages living in towns across Northern Ireland. 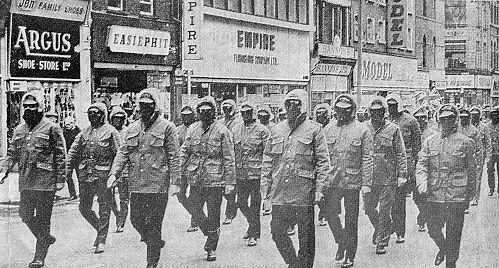 The report said that the campaign had gone virtually unreported despite the fact that Loyalists had carried out over 200 bomb attacks. Many Catholics had been forced to abandon their homes. The reported highlighted the situation in Carrickfergus, County Antrim, where it was claimed that members of the South East Antrim Ulster Defence Association (UDA) were responsible. 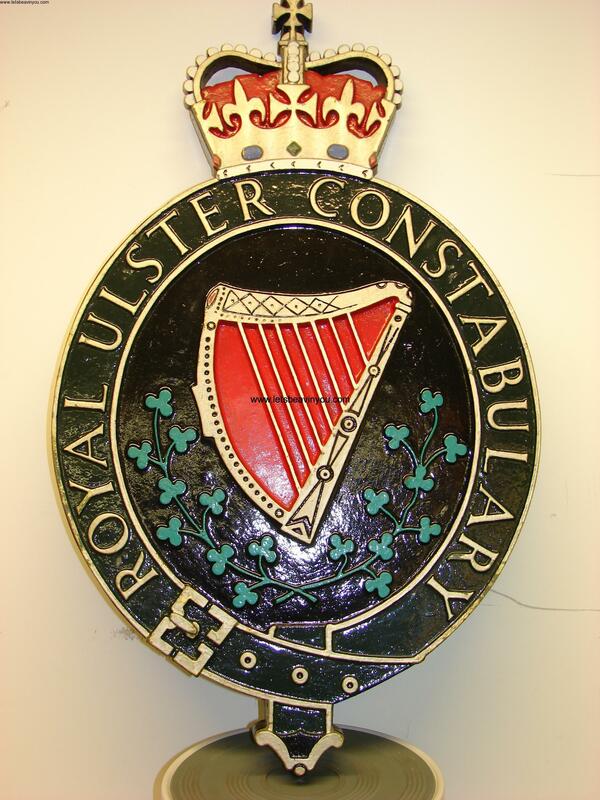 Royal Ulster Constabulary (RUC) officers moved to clear Loyalists from Drumcree after coming under a barrage of stones, bottles, and firecrackers for the second night in a row. However violence continued at Drumcree and demonstrations and protests spread throughout Northern Ireland. Died 6 days after being hit on the head by missile thrown from a crowd during street disturbances, Springfield Road, Belfast. .
Found shot on waste ground, Twickenham Street, Shankill, Belfast. Shot by sniper while at British Army (BA) pedestrian check point, Butcher Gate, Butcher Street, Derry. Shot, outside his home, Glastry Gardens, Kilcooley, Bangor, County Down.